The Standard of the Industry and the recliner that started it all! This first recliner specifically designed to improve the comfort and mobility of residents in extended care facilities. The Lumex Three Position Recliner easily adjusts into any one of three positions: sitting, TV or full recline. Recliners offer numerous therapeutic benefits including position changes that can aid in circulation and ease discomfort from respiratory, heart and other ailments. 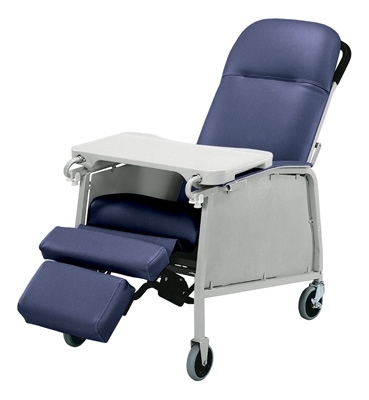 A position lock allows only the caregiver to secure the chair in any one of the three easily attained positions. Recliner encourages natural relaxation and improved blood circulation. Flex-o-Lator seat support system increases comfort by reducing the risk of “bottoming out”. 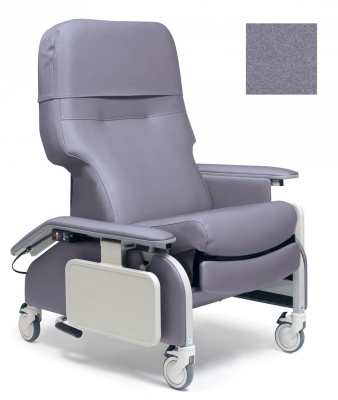 Ergonomically designed seat and back with varied density foam construction provides correct support. Articulating headrest quickly adjusts to maximize individual comfort requirements. For safer, easier transport, the Lumex Three Position Recliner features two, four inch swivel casters with wheel locks and four inch fixed front wheels. The molded activity table can be fixed in position or left unsecured for easy exit from the recliner. Durable welded steel epoxy coated frame is easy to clean and maintain. Weight Bearing Capacity: 250 pounds. Website powered by & Maintained by Crewits LLC.